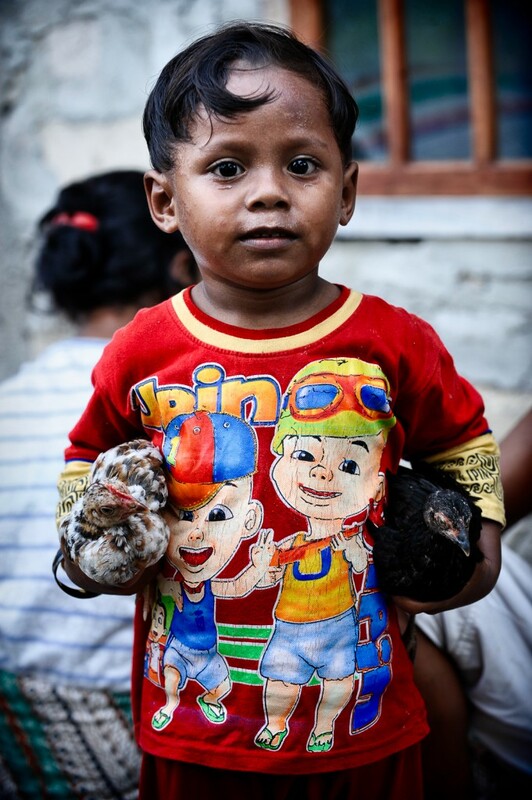 I met the little boy during a diving vacation in Wakatobi, a small group of islands in the southeast of Sulawesi. The village is on a small island right next to the very secluded Wakatobi Dive Resort. People here live mostly from fishing and nowadays also from having jobs at the dive resort. It’s a cute little village with mostly stone houses and a school painted in blue. I’m not sure how the village looked like before the divers came to Wakatobi. I know the divers brought jobs and a higher level of wealth. Yet, the resort doesn’t alter the surrounding nature and the people’s way of life too much. It’s not the kind of tourism that scales with the number of people but keeps an eye on sustaining a good balance. Anyhow, the boy seemed quite happy with his little chicken toy he presented me proudly. He had a house to sleep in, clothes to wear, warm meals to eat and a chicken friend to play with. I don’t know whether he will leave the place of his birth to find fortune in a big city or else where. I’m not sure how our civilization will take hold of these people earlier or later. However, I know it will happen one day. And we can only hope it will still take a while. people in the village were very humble and friendly. They didn’t speak much English and were a bit shy in front of the camera. I still was able to get a couple of good images. Check them on my flickr.